It is 1864 rural Virginia, and as the Civil War winds down, young Amy (Oona Laurence) hunts for mushrooms in the Spanish moss-draped woods near Miss Farnsworth’s Seminary for Young Ladies. When she finds a seriously wounded Union soldier, Corporal John McBurney (Colin Farrell), the wheels of this dark story are set in motion. 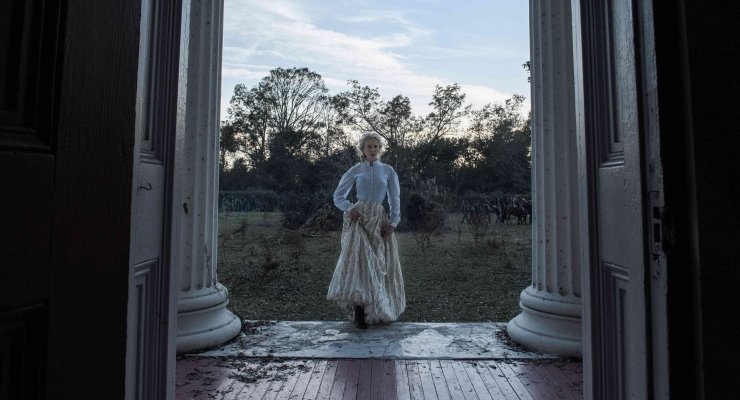 Led by Miss Martha Farnsworth (Nicole Kidman), the Seminary’s headmistress, her young students carry the unconscious soldier into the antebellum mansion’s music room. Miss Martha tends to the Corporal’s wounds (and other elements of personal hygiene) while hiding him from Confederate troops that still may be in the region, as it is treason to aid an enemy. Hearing the distant artillery booms and seeing clouds of smoke show viewers that the war is still being waged. McBurney gradually recovers and reveals that he is an Irish mercenary who fled the battlefield when his company was attacked. In addition to Miss Martha, the school’s other residents are the sexually repressed etiquette teacher Edwina Dabney (Kirsten Dunst), the randy teenager Alicia (Elle Fanning), little Amy and her pet turtle Rochester, and a trio of young music makers-Jane (Angourie Rice), Marie (Addison Riecke), and Emily (Emma Howard). McBurney is polite and uses his natural Irish charm to “beguile” these innocent women, sequestered like hothouse plants in their dimly lit surroundings. The Corporal is also skilled at discovering the women’s “soft spots “: Edwina’s pent-up frustration, Alicia’s carnal desires, and Martha’s nascent attraction to him. In spite of persistent gimpiness, McBurney proves a competent gardener and entertaining dinner guest. After several weeks have passed, Miss Farnsworth informs the Corporal that she thinks he is well enough to return to his fellow soldiers, the very last thing that McBurney wants to do. To extend his stay at the Seminary, McBurney must establish a meaningful (read: sexual) relationship with Edwina. But when the teacher finds the Corporal bedding down with Alicia, she initiates his literal and figurative downward slide that triggers the final act of this film. The 1971 version of The Beguiled was based on the Thomas Cullinan novel and directed by Don Siegel (Dirty Harry). With leads, Clint Eastwood and Geraldine Page, the story was presented as a gripping Southern Gothic tale, in quite explicit, occasionally violent, and quasi-mythologic terms, as the Seminary’s women become Maenads and McBurney, its Orpheus figure whom they seek to destroy. Writer/director Sofia Coppola (Marie Antoinette, Lost in Translation) used the same literary source but delivers a distinctly different film. Told from a more evident female perspective, Coppola’s version is less sexually explicit and tones down the dramatic motivations for its female leads, Kidman, Dunst, and Fanning. Kidman bottles up her physical desires, making her ultimate act of brutality even more impactful while Farrell is a sly devil who uses his Gaelic guiles to get the impressionable adolescents vying for his attention. Philippe Le Sourd’s atmospheric cinematography completely envelops the characters in the shrouds of a dark-hued and claustrophobic Southern mansion. The new version also scores over its predecessor in its more precise attention to period costumes and décor. 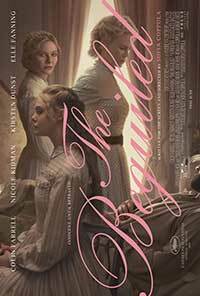 Those who have seen the original film may be less “beguiled” by this new release but I found Coppola’s 2017 approach to be at least as valid and actually preferred its greater economy of expression. Highly recommended. A successful remake of this psychological Civil War thriller that tells the story of a Union soldier housed in a women's seminary from a distinctly female point of view.